You might as well expect rivers to run backwards as any man born free to be contented penned up. This post is the fourth in a series of blog posts on the subject of connections in Nature; how man is gradually destroying these vital connections that keep him alive; and possible ways to work with Nature to conserve these extremely important connections. 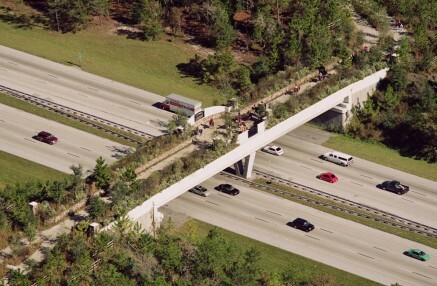 Ecological Corridors – Restoring Nature’s Wildlife Corridors. I am hoping that the material in this series will be helpful to environmental educators as they plan lesson sets. I also hope that students will use the information to develop their own presentations and projects. And, of course, I hope the material will be useful to all of you who are stewards of Nature who are looking for ways to conserve Her. Some project ideas are presented at the end of this post. Imagine yourself living out your life in only one room in a house. You never leave the room even though you may be able to look out a window to sense the rest of the world. You eat in the room, sleep in the room, and carry out all your bodily functions in the room. You are unable to interact with other members of your species. You are kept in this room by the force or the influence of other creatures on this earth. You want to leave the room to roam and to procreate but are unable to do so. Human society considers this scenario an act of kidnapping, false imprisonment, legal imprisonment, or child endangerment. It is never thought of as good because we humans see freedom to roam as a right, a positive social interconnecting force, and a requirement for acquiring essential life services like food, water, and the ability to procreate. So, why don’t we humans respect the need for other creatures on this earth to roam?? Like we humans, animals need to roam. Like we humans, animals need to seek habitat and food. 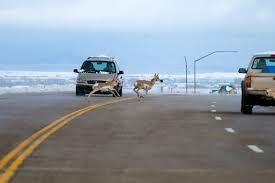 Animals need to migrate in order to protect themselves from seasonal climates, to take advantage of food sources, and to procreate in a way that produces genetic viability. With the ongoing massive human population boom, land use has resulted in wildlife habitats that are highly fragmented “patches” that are fenced off, divided by highways, urban sprawl, and farms, used for logging, or otherwise developed or arranged so that wildlife are unable to roam. Land that was once contiguous, is now broken into several smaller unconnected pieces that are sometimes referred to as habitat “islands”. Human land use has resulted in these pieces of habitat not being connected to other habitat islands. We humans have both consumed the many natural habitats of wildlife and blocked their movement. We humans, in ignoring the need for animals to roam, are squeezing these creatures off of planet Earth. Fragmentation can cause problems for wildlife because it can separate individuals within a population as well as separate them from important resources. Habitat fragmentation can lead to an overall reduction in species population, less biodiversity, potentially local extinction of plant or animal species, as well as susceptibility to inbreeding and an increasing prevalence of genetic defects. Fragmentation can make a species less protected from its predators. Ironically, fragmentation has also come from the establishment of national parks and protected areas where habitat islands are unwittingly created. Government agencies who oversee public lands as well as non-government organizations (NGOs) who also oversee protected areas have led us to believe that, through the fragmenting of land into preserves, they are “managing” Nature in a positive way. Beyond these rings of government created conservation kingdoms and NGO conservation activities, we see agriculture consuming huge quantities of habitat. Within these private lands, there are few protective measures for wildlife. A recent example is the protected gray wolf in Yellowstone National Park. If a hapless gray wolf choses to roam beyond the boundaries of government protected land, chances are it will be shot by either a rancher who sees the wolf as a predator who will kill his cattle or a hunter who is looking for a trophy. While our stewards of Nature are gradually working toward a holistic world view of conservation, the political will of agriculture and hunters is a huge force that is preventing the free roaming of animals in this world that is dominated by mankind. Fragmentation is not just the physical breaking up of land parcels. 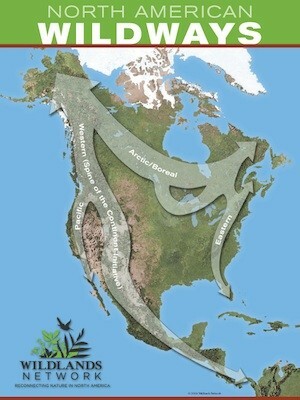 Fragmentation also happens when humanity disturbs ecological processes such as the migration of birds. There are major migratory bird flyways throughout the world. By fragmenting or disturbing habitats at both ends of a migratory pathway, bird species can be severely affected or cease to exist. One of my blogs talks about the San Pedro River in Southeastern Arizona. The drawing down of the river’s aquifer by local human communities, and the lack of enforcement of the illegal cattle grazing of the shoots of new trees, is affecting the health of cottonwood and willow trees along the river banks. All of this results in habitat loss. In turn, there is less protection for the migrating birds. E.O. Wilson has an audacious vision for saving Earth from a cataclysmic extinction event. “Islandisation” can have a disastrous impact on wildlife, according to Dr Wilson, whose theory of island biogeography is regarded as the authoritative explanation for why confined landscapes inevitably lose species. Small areas can become islands, and without ‘bridges’ to connect them to similar habitats, species are more likely to become extinct. This is partly because wildlife need to draw from a broad gene pool to avoid the “genetic anomalies” that become more likely when breeding with relatives. Furthermore, island populations are disproportionately vulnerable to disease, over hunting or catastrophic events like floods or fires and linking habitats together provides a life-line by helping the movement of species and their genes. Speaking in 2012, following the publication of The Social Conquest of Earth, Wilson told Smithsonian Magazine that he believes: mankind can change from “conquerors to stewards in terms of protection of the planet“. He said: “It’s been in my mind for years, that people haven’t been thinking big enough—even conservationists. Half Earth is the goal, but it’s how we get there, and whether we can come up with a system of wild landscapes we can hang onto. “I see a chain of uninterrupted corridors forming, with twists and turns, some of them opening up to become wide enough to accommodate national biodiversity parks, a new kind of park that won’t let species vanish.” “We have the intellectual and moral capacity to do it, but I’ve also felt very strongly that we needed a much better understanding of who we are and where we came from. We need answers to those questions in order to get our bearings toward a successful long-term future, that means a future for ourselves, our species and for the rest of life,” he said. “In writing ‘A Social Conquest of Earth’, I very much had in mind that need for self-understanding, and I thought we were very far short, and we remain very far short, of self-understanding. We have a kind of resistance toward honest self-understanding as a species and I think that resistance is due in part to our genetic history. And now, can we overcome it? I think so.”The two-time Pulitzer Prize-winning scientist called his theory ‘Half Earth‘, and said by withdrawing from half of the planet, humans could help prevent the “biological holocaust” we are currently heading for. 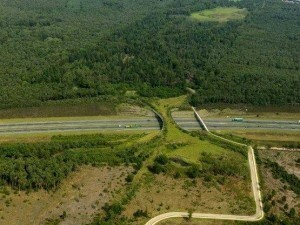 Wikipedia defines a “wildlife corridor”, a “habitat corridor”, or a “green corridor” as “an area of habitat connecting wildlife populations separated by human activities or structures (such as roads, development, or logging)”. Habitat corridors allow movement between isolated populations, promoting increased genetic diversity. They provide food and shelter for a variety of wildlife and help with juvenile dispersal and seasonal migrations. 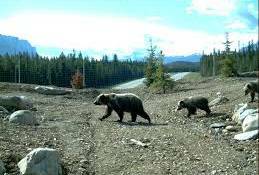 Habitat corridors can also minimize interaction between humans and wildlife by allowing predators, such as wolves and bears, to hunt for food in other locations, minimizing their threat to people. The corridors can also serve to minimize wildlife encroachment into human populated areas during natural disasters such as wildfires or floods. “We are urgently creating Wildways, large pathways for wildlife by connecting our national parks and wilderness areas with wildlife corridors. If we succeed, we will give our forests and animals enough space to thrive and adapt to climate change“. This organization provides a map of its existing and future corridors which is shown here. The second premise in the credo for this blog states that “Conservation is the act of identifying and preserving Nature’s interconnections.” In this blog post, we are seeing this process gradually taking place. The need for preserves and refuges has been firmly established over the years. More recently, the necessity of connectivity within Nature is becoming known. We are now beginning to see proactive measures being taken to identify and preserve vital wildlife corridors between habitats. All this is well and good. E.O. Wilson’s idealistic vision is where humanity needs to head. With programs that I noted above and in the supplemental list below, we are making a good start. In my view, the secret to the establishment of wildlife corridors lies with the farmer and rancher because the agricultural industry controls a large part of our open lands. Traditionally, farmers and ranchers are lovers of wildlife unless the wildlife affect personal income. Conservation easements and subsidies are tools that have the potential of resulting in new wildlife corridors. What is needed is good science, community support, and expert facilitators, both government and private, to work with the farmers and ranchers. So, where do you fit into all of this?? It all gets back to you building and exercising your “connectivity consciousness” wherever you live. The suggestions that follow can become a great educational experience for any dedicated individual or as a living project for any group of students whether they be junior high, senior high, or college students. First, start by identifying the habitat “islands” that mankind has created in your area. Whether these “islands” are created by urbanization, poorly planned natural preserves, or bad ecological practices, this exercise will help you see where there are needs for corridors. Map out some ideas on paper. If you are a member of a conservation organization of any kind, start talking to your fellow members about your ideas. You might also talk to people who work for the National Park Service, the US Forest Service, or the Bureau of Land Management. If you are a junior high, senior high school, or college student, talk to your biology teacher, or approach one or more professors at a local college or university. These latter suggestions might result in you starting a student movement to address the habitat isolation problems in your area. You will also develop a cadre of scientific expertise that can help define the problem more precisely while proposing various solutions. In your dialogs with people in these organizations, solicit their expert help and build a plan of action. If you get the cold shoulder or hear a lot of excuses, move on to other groups until you start seeing progress. 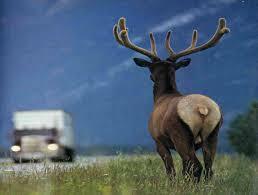 The Conservation Corridor is an organization dedicated to maintaining wildlife corridors. 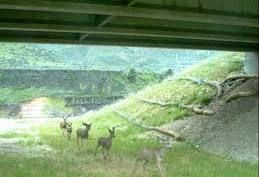 Here is a handy list of programs and tools for analyzing and assessing corridors for wildlife. The Missing Link – The Race To Protect A Crucial Wildlife Corridor. Wild Life – The Ocean’s Border: This breathtaking series provides a magical tour of some of the world’s most pristine beautiful places – full of biodiversity and lush with life! Natural bridges between continents create extraordinary richness, and unique flora and fauna seen nowhere else. The Netherlands has 600 bridges to help animals get across highways safely! There is a very popular section in my blog entitled “Musings”. You can reach it by clicking on the menu tab near the top of my blog site. This area contains my growing list of posts that list web material that I have found interesting. You might stop by an take a look.